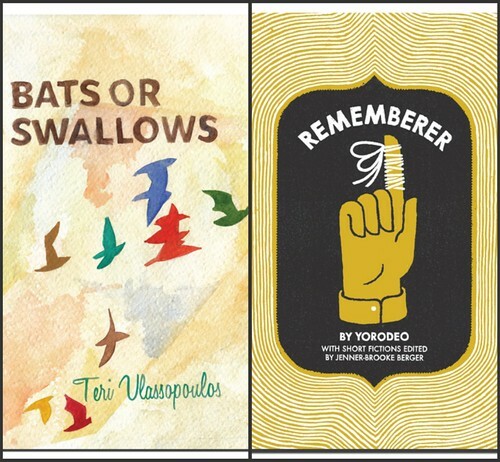 Montreal and Toronto book launches! For awhile the thought of a book launch made me nervous. Not just reading in front of everyone, but the logistics of it, all the inviting and planning and figuring out what to wear. And what to read. And, I don’t know, it’s a book, just buy it and read it curled up in bed or on the subway to work and why do I have to be involved anyway? Now that plans have fallen into place (thanks to Nic and Jenner), I’m excited for the launches planned in Montreal and Toronto, to enjoy everything about them, even the nervousness. It’s good for the character to be nervous sometimes. So, details! The amazing Jenner Brooke-Berger is going to drive down from Halifax to launch with me in Montreal. 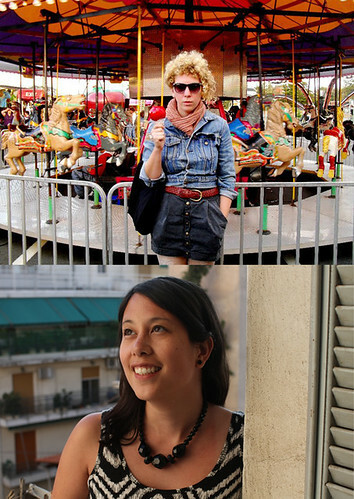 She’s the editor of Rememberer (the other fall 2010 Invisible release, remember? No? Buy a copy of the book then!). I’ll read from my book, she’ll read from Rememberer (and maybe some other contributors will join us), you can pick up copies of the book and you’ll have a great time. Dora Keogh Pub, 141 Danforth Ave. There might be a Rememberer party in Toronto too. If not, they’ll launch on Monday as well. I’ll keep you posted, as always. 1) For those of you in Montreal, I’m going to be doing a reading this Thursday November 19, 2009 at Depanneur Le Pick Up (7032 Waverly). It’s me and Sean Michaels, who writes one of the most magical music blogs on the Internet, Said the Gramophone. I’m not exactly sure what I’m going to read yet, but please come by if you’re in the area. It starts at 7. I wonder if the Pick Up will be serving pulled pork sandwiches? I hope so. Thanks to Jeff for asking me to read! 2) I can’t believe I haven’t talked about CJAM here. CJAM stands for Clinique Juridiques des Artistes de Montreal, and I’ve been volunteering with them for the past few months as their treasurer. CJAM is this amazing initiative spearheaded by Keith Serry and Olivier Plessis, two law students at McGill, to get a free, accessible legal clinic open for arts-related issues. Imagine you’re an emerging writer or painter or filmmaker and you’re given a contract – you probably don’t have the money to spend on a lawyer, right? CJAM hopes to bridge that gap by initially offering workshops on law-related issues and having a legal information service. At Pop Montreal a few weeks ago, CJAM hosted a workshop with a tax lawyer. I mean, it’s not the most glamorous subject matter, but it’s important for people to know their rights, and to have access to do so. There’s a team of 11 of us (plus some lovely volunteers) working to get the clinic off the ground and, guys, it’s a lot of work. Everyone is balancing school + jobs + family with their CJAM tasks, but we’re really psyched about how it’s going to turn out. We’re going to launch the first stage of the 2009 workshop schedule and the legal information service with a special event at Le Cagibi (5490 St-Laurent) on Friday November 27, 2009. The doors will open at 6:30pm and the event starts at 7pm. 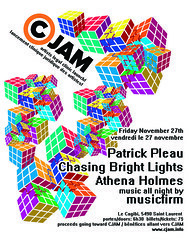 Patrick Pleau, Chasing Bright Lights and Athena Holmes will perform, and there will be music by musicfirm. The tickets are $7 and all proceeds go to supporting the artists and CJAM. If you’re interested in a ticket, please let me know – Cagibi will fill up fast and I know it will be a great night. You can read more about CJAM and the event over here: http://cjam.info.